Now I’ve had my fair share of pork during my 42 years on this planet but NONE has even come close to the Lechon that was prepared for us by the Lucero family in Villaba, Leyte, Philippines! The post’s photos may be a bit much for those that have never seen “Porky” go from wallowing in it’s own filth to the plate, but it must be said, from the word “Go” the process was respectful above all to the wonderful animal that gave it’s life to fill the tummies of nearly 100 people. We were blessed to visit a very rural part of Philippines this past year and we got way more than we bargained for. From meeting the most wonderful family, the Lucero’s, to surviving a Category 4 Super-typhoon called “Ruby” (and just about everything in between!) One of the most memorable and delectable parts of our visit was the lechon that was prepared for us. The pig, “Porky” weighed in at a massive 68kg (150 lbs) and well, let’s just say it was the largest pig I’ve ever had the pleasure to help devour. It started at 4:00 am with a very quick and respectful dispatch. It took about 7 grown men to accomplish the task but once done, the crew got to work. They had boiled a few pots of water to help blanche the skin in order to remove all of the top few layers of the dermis. By the time they were finished the carcass was as smooth as silk. She was gutted and nothing had gone to waste. You see, in this part of the world every piece counts and it really helped me realise how lucky we are when we see our pre-packaged meat at the butcher’s counter! The cavity was then prepped with a variety of spices along with a large number of lemon-grass stalks. She was sewn up with a copper hook and twine and then rotated, by hand, for just over 4 hours. The fire set up was crucial. They basically built two large fires with hard wood about 2 meters across. The pig was spun in between ensuring that it was getting even heat from both sides throughout the roast. It was bloody hot outside as it was and I’ve got nothing but respect for the lads that sat there hour after hour spinning “Porky” to a wonderful end, poking any blisters so that it rendered out some of the fat, keeping the crackling intact! We were ready to eat at about 3PM. The result was insane! I’ve never had crackling like that before and the pork was as tender as could be with bursts of spice and lemon grass throughout. Did I mention that the crackling was the BEST I’ve ever had? I still dream of it on hungry nights. The lechon fed the entire village and then some. What wasn’t eaten then and there was packaged up in small plastic bags to be distributed to the less fortunate in the village. Again, food for thought! I wanted to post this story because THIS is what true barbecue is! Its about respect, its about knowledge, its about taste and it’s about love! We were so grateful to Chef “Lito” and his band of merry men for sharing with us the most incredible meal ever! Salamat! Can I get a “woot woot?” Sunday roast dinner with Ben Lock, Fifi Marée and little man Destin proved absolutely fantastic! 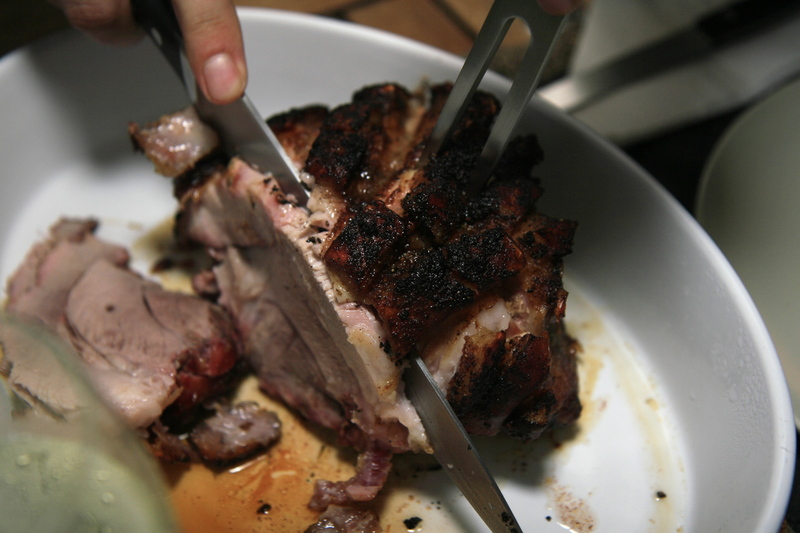 A new recipe on the Big Green Egg: a herb encrusted French cut bone in pork loin. This recipe took a bit of preparation so if you do have two days in advance, I’d recommend you do give this a try! You’ll need a 1.6 kg bone in pork roast to start and a few other ingredients to make the magic happen! 1/2 cup of fresh minced garlic. Some freshly cracked black pepper – about 15 turns should do. Whisk this all up and then add your pork roast to a zip-top bag, add the brine to the bag and put it in a non-reactive bowl in the fridge overnight. The bowl helps as in my case, the bag split at some point and the pork was still fully submerged! First, take a small sharp knife and pierce the roast about 4cm deep all around the roast. Add a sliver of garlic into each one of the incisions you make. Next, truss your roast with some butchers twine. This ensures that the roast will cook evenly and it presents really nicely as a result. Once done, move to the marinade. Combine all of the ingredients listed above in a blender. Pulse about 10 times until you get a really nice paste. If it looks too dry, add a bit more olive oil. Once done, give it a taste and add only a bit of salt as the brine as already done a lot of the salting for you. Put the roast into a clean zip-top bag, add the marinade and give it a bit of a massage. Make sure you coat the entire roast evenly. Now pop it back in the fridge until roasting time. For your grill set up you’ll need to get the temperature stable at about 325F (163C), indirect heat. Get a drip pan filled with warm water and add a small bit of wood. In my case I used cherry wood, but only a little bit to add a hint of smoke to an otherwise delicate meat. Let the smoke turn from white to a very light blue and then get ready to roast! 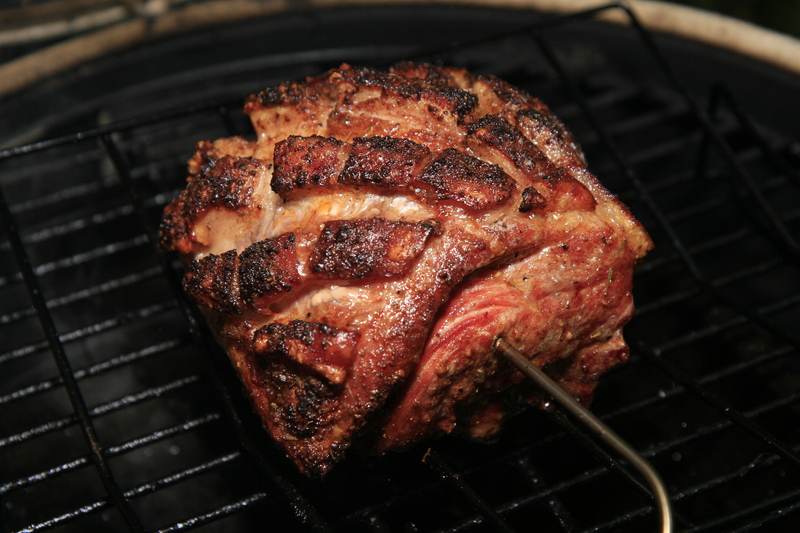 Get a rack over the drip pan, insert your thermometer into your roast and shut the dome. No peeking until the internal temperature hits 140F (60C). That should take about 90 minutes for a roast this size. Once you reach your internal temperature, remove the rack and tent it with some aluminium foil for about 10 minutes. When ready, remove the butcher’s twine first and then cut the roast into even chops between the bone. Serve with some roasted vegetables and a side salad and you’re done! 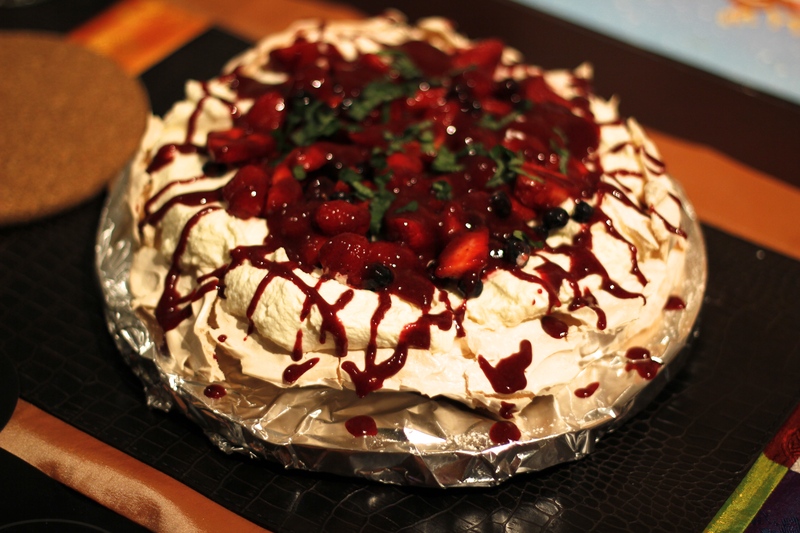 As usual the meal was delicious but again I was trumped by Heather’s homemade Pavlova! I’m not sure she’s willing to share her recipe but let me tell you, it was one of the BEST desserts she’s ever made. Full marks for the Pav babycakes! 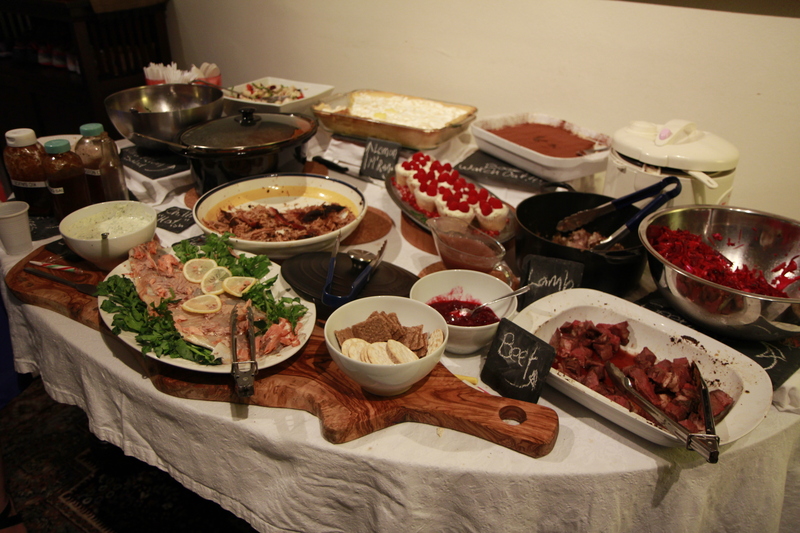 All in all, a wonderful night with great company and amazing food! Overall Pavlova Rating: OFF THE CHARTS!